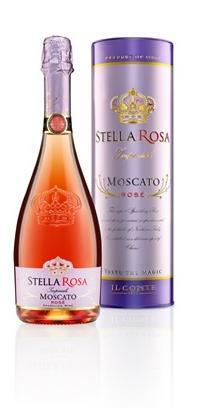 Stellabrate Valentine’s Day with New, Specially Packaged Stella Rosa Moscato Rosé! *America’s favorite semi-sweet, semi-sparkling wine, Stella Rosa, introduces a new specialty Moscato Rosé tin just in time for Valentine’s Day. This award-winning, delicious pink bubbly from Stella Rosa’s Imperiale line bursts with refreshing notes of yellow peach and red berries. It’s the perfect wine to toast to romance with your sweetheart this Valentine’s Day, and the beautiful tin package makes it ideal for gifting. For those who are single this Valentine’s Day, the sparkling Moscato Rosé is also fitting for celebrating love, friendship, and good times. Stella Rosa even offers delicious cocktail recipes online to spruce up any party. Stella Rosa was created 14 years ago by California’s Riboli Family, now celebrating 100 years of award-winning winemaking. It quickly became the U.S.’s favorite wine in its category. Stella Rosa is America’s number one imported Italian wine and the second fastest growing brand among the top 30 wine brands nationwide, according to Nielsen data (Total US xAOC; 52 w/e 12-31-2016). About Stella Rosa Wines: Award-winning Stella Rosa wines originate from a small town in Northern Italy. Stella Rosa is a selection of wines created and imported by California’s Riboli Family Wine Estates, owned and operated by four generations since its establishment in 1917. For more information, visit www.stellarosawines.com. For interview or bottle shot requests, please call Melissa Gonzalo at 323-330-8789, or email mgonzalo@riboliwines.com.